Book a lake trip in May or June and you'll find the guides of Reel Angling Adventures can cook up some spectacular ultralight- and fly-fishing action with the fish of your youth! Beginners and experts alike ... everyone enjoys the fun they have when they join in on the fastest fishing action found during the late spring and early summer months. 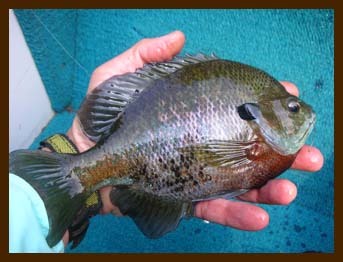 Panfish! And not just any little ol' fish. Bluegills, green sunfish, shellcrackers, redbreasts, long-eared sunfish, scrappy white bass and channel catfish found in the lakes of the Appalachian Mountains of northern Georgia and western North Carolina are feisty slabs! 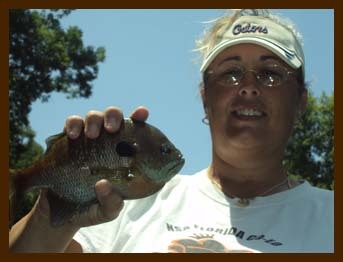 We're talking about bream commonly measuring 9 to 12 inches and white bass that top the 3-pound mark! mountains fight harder than any other game fish! Fun for you! bait or fly. In fact, there may be no better time to wet your first fly line than when targeting the spring and summer runs of panfish. of these species continues through August. Bluegills, Redbreasts, Green Sunfish, Longears, Shellcrackers and White Bass! Arranged on lakes Blue Ridge, Chatuge, Hiwassee or Appalachia depending on local conditions.